Reservation Deposits and Cancellations: A Reservation is not confirmed until both thesigned Home Rental Contract and Reservation Deposit have been received by the“Company”. A Reservation Deposit equal to 50% of the total rent is due by wire or credit card at the time of booking. Green Season (May 1 through Nov 15): The balance of the reservation is due 60 daysprior to arrival date. Credit card payments will be automatically charged atthis time. If the reservation is booked within 60 days prior to arrival, theentire stay is due at the time of booking. “Guest” may cancel a reservationduring Green Season (May 1 through Nov 15) by providing written notice via e-mailto rentals@lascatalinascr.com, a minimum of 60 days prior toArrival Date. The receipt of the notice must be confirmed by return e-mail bythe Reservation Department for the cancellation to be considered accepted. Uponsuch notice, any Reservation Deposits previously paid by “Guest” shall berefunded minus any bank commission. High or Peak Season (Nov 16 – Apr 30): The balance of a reservation during PeakSeason is due 6 months prior to arrival date. Credit card payments will beautomatically charged at this time. If the reservation is booked within 6months prior to arrival, the entire stay is due at the time of booking. Allreservations booked during Peak Season are non-refundable and not subject tochange. If cancellations occurs during the High or Peak Season (Nov 16 – Apr30), “Guest” will forfeit all sums paid. CPMS,LIMITADA, with Corporate Identification Number 3-101- 627280 (the “Company”);and “Guest” or any person(s) who shall occupy the Home at the invitation of the“Guest” during the Rental Period, have agreed to enter this Contract for therental of the Home indicated above. By execution of this Contract, “Guest”agrees to abide by all of the Terms and Conditions set forth in this Contract. 6:00AM - 7:30AM - Construction may begin, with workersrequired to speak in low voices and no power tools are allowed. 6:00PM - 9:00PM - Construction may continue, with workersrequired to speak in low voices and no power tools are allowed. Beach Club Access: Only guests staying in Las Catalinas homes and apartments are welcometo use the facilities of the Beach Club from 7:00am – 7:00pm. Access will notbe granted to any guest not staying at Las Catalinas as the Beach Club is aprivate facility for renters and members only. Damages:“Guest” must pay a Security Deposit in the amount of $1000 for homes and $500for apartments “Guest” shall be responsible for any damages to the Home orPremises or any furniture, fixtures, furnishings, or other property of HomeOwner located therein, which is caused during the Rental Period by the “Guest”,members of his party, invitees, or any person in “Guest’s” employment orcontrol. “Guest” shall immediately notify Management Office of any suchdamages. “Company” shall have the right to collect damages on behalf of theHome Owner by deducting such damages amounts from the Security Deposit. If anysuch damages exceed the Security Deposit amount, “Guest” shall be responsiblefor prompt payment of any such excess damages, and “Company” shall have theright to collect excess damages by billing “Guest’s” credit card or billing“Guest” directly. Neither “Company” nor Home Owner shall be responsible for anydamage to “Guest’s” personal property and belongings that are maintained on thePremises. “Guest” shall pay to replace any furnishings if any stains caused by“Guest” or “Guest’s” invitees on such furnishings do not come out afterreasonable effort by cleaning service selected by “Company”. A completebreakdown of any deductions from the Security Deposit will be provided to“Guest”. “Guest” shall report any maintenance, repair or inventory deficienciesto “Company” staff immediately upon arrival, otherwise it is deemed accepted inpresent condition. Pets: Nopets are allowed. We reserve the right to terminate any rental, without refund,if pets are found on the premises, and charge an additional $500.00 fee aspenalty. The Security Deposit will be retained if pets are on the premises. Smoking: Nosmoking is allowed at Home. We reserve the right to terminate any rental,without refund, if smoking occurs at any Home, and charge an additional $500.00fee as penalty. The Security Deposit will be retained if there is smoking atthe premises. Housekeeping:The Home will be cleaned and inspected before your arrival. Housekeepingservices will be offered daily at no extra cost. If you require additionalservices, please contact the Management Office. Inventory: “Company”is not responsible for providing any additional furnishings or appliances notpresently in the Home. “Guest” may not remove any of the furniture or furnishingsfrom the Home, nor place interior furniture or furnishings on the porches orlawns where such furniture or furnishings would be subject to unusual wear andtear. Hold Harmless “Company” and/or Ownerdoes not assume any liability for loss, damage or injury to persons or theirpersonal property, nor do we accept liability for any inconvenience arisingfrom any temporary defects or stoppage in supply of water, gas, electricity orplumbing. “Company” and/or Owner will also not accept liability for any loss ordamage caused by weather conditions, natural disasters, acts of God, or otherevents beyond our control. “Guest” hereby acknowledges thathe/she is fully aware that the terraces, beach, pool, public sidewalks, andsurrounding patio can be dangerous, that floors and stairs both inside andoutside can be slippery when wet, and that injury is likely to occur to anyonewho is not careful. With full knowledge of the above facts and warnings,“Guest” accepts and assumes all risks involved in or related to the use ofterrace, beach, pool, public sidewalks, patio, stairways and other indoor andoutdoor areas. Private Residence: “Guest” acknowledges that the Home is a private residence, currentlyowned by a third party. “Guest” agrees not to enter or to force open any lockedclosets or rooms in the Home which are reserved by Owner for his personal use.Since the Home is ruled by an HOA, “Guest” agrees to abide by such rules andregulations, including but not limited to noise ordinances. “Guest”acknowledges that neither the Owner nor “Company” has any control overconstruction in the residential community, and therefore is not liable forconstruction noise and activity. By accepting these terms, “Guest”certifies that he/she has read and accepted the Contract in its entirety. BindingArbitration, Arbitration Agreement. Any and all disputes, claims, differences,or controversies arising out of or in relation to any aspect of this Contract,its business matters, performance, liquidation, interpretation, validity or anybreach thereof, shall be resolved by arbitration in accordance with the bylawsof the International Center for Conciliation and Arbitration of the CostaRican-American Chamber of Commerce ("CICA"). The parties hereby agreeto submit voluntarily and unconditionally to its rules and bylaws and claimknowledge thereof. GoverningLaw: This Contract shall be governed and interpreted according to the laws ofthe Republic of Costa Rica (“Civil & Commerce Codes”) and the “General Lawfor Urban & Suburban Rentals” does not apply. All actions orcauses arisingout of this Contract shall be brought in the Republic of Costa Rica. Casa Sonrisa expertly weaves together indoor and outdoor living areas. Each bedroom has a private bathroom which are separated by classy courtyards and fountains. The courtyard feature an outdoor BBQ space with immediate access to the fully equipped kitchen opening to the living room with fantastic ocean views. The outdoor dining table is the ideal spot to savor a meal to the sound of the crashing waves and calming ocean breeze. The infinity pool gives you a picture-perfect sight of the ocean. Step into the main level and find a guest suite featuring a king size bed and spacious bathroom with beautiful mosaic floors. 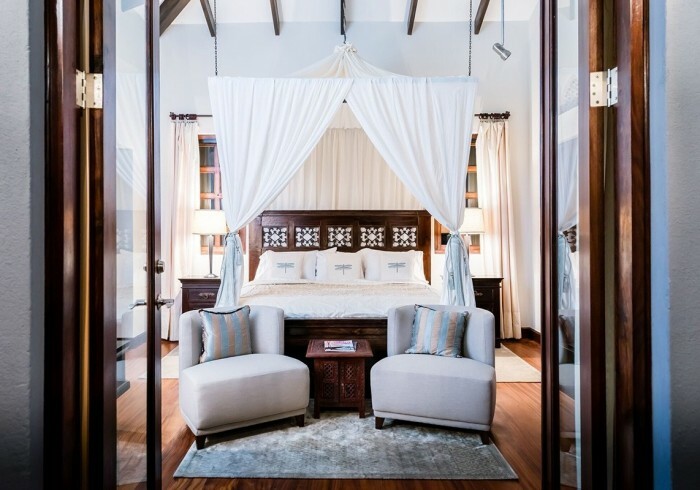 The upper level houses the kids’ suite offering two single beds, along with the master suite featuring a king size canopy bed, a large terrace with magnificent views of the ocean, and a private bathroom. All rooms and areas feature A/C, ceiling fans, TV, WiFi, and phone. All houses offer Signature House Mom Service, concierge service, and beach club access.